With an all-titanium structure and true underwater capability at its heart, the TYPE 5G is the ideal watch for the gentleman diver, whether he's in the water or around town. TYPE 5 is the only mechanical watch to be perfectly readable underwater regardless of the viewing angle. The use of oil (37.5ml) inside the upper part of the watch (dial and module) cancels out what is known as Total Internal Reflection. Typically, when under the water, a traditional diver's watch needs to be viewed straight on in order to be read properly - otherwise refraction turns the glass into a mirror. But not with an oil-filled watch: this gives it complete legibility whatever the angle of view. This is a world first for a mechanical watch. The use of oil has been done for another good reason. Since the laws of hydraulics state that a liquid cannot be compressed, the oil compensates for pressure underwater (rather than protecting the watch by using an over-sized case and thick glass). There are other advantages too: the oil keeps the 142 components of the ROCS (in-house patented complication module) constantly lubricated. And since they are suspended in a liquid, they are lighter and hence require less power to move, which in turn improves time-keeping. The result is a watch both functional and more ergonomic than traditional diver's pieces. The TYPE 5G is designed to be able to withstand extreme conditions - but to do so with the modernist sophistication characteristic of RESSENCE. Dial and case become one. The titanium discs, rings and bezel are all microbilled and amplify the visual impact of the unique all grey look. The watch's use extra strong blue Superluminova. The readability of the TYPE 5 is therefore as simple and efficient during the day as during the night. The organic design of the TYPE 5 takes its inspiration from sea turtles. Their distinct aqua-dynamic shape means they are best able to propel themselves easily through the water - so what better shape too for an amphibious watch, right down to its seamlessly integrated uni-directional bezel. 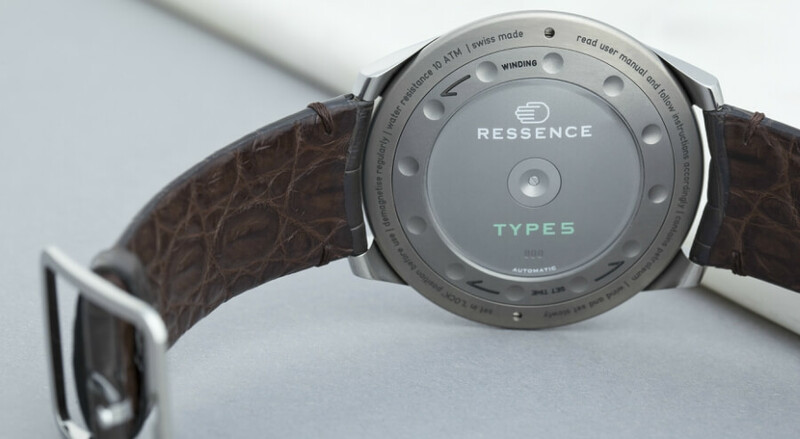 TYPE 5 capitalises on the 6 RESSENCE technical solutions based on physical principles: Display by discs, No crown, Oil-filled, Bellow system, Magnetic transmission and Hydraulic shock absorber. The magnetic transmission from the base movement to the ROCS ensures that in the event of a significant lateral shock, the micro magnets located on either side of the membrane can momentarily decouple. 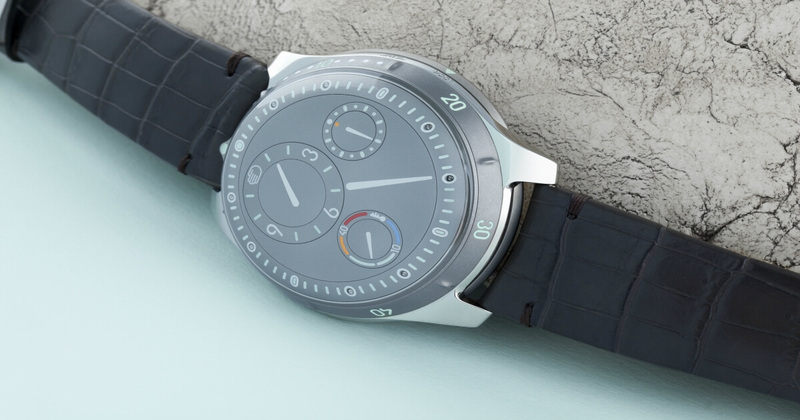 To compensate for this phenomenon, on its TYPE 5, RESSENCE has introduced a hydraulic shock absorber. It is a small disk that is an integral part of the ROCS 5 the underside of which has blades. Equipped with a gear ratio 1/40, it starts to turn very quickly in the event of a shock and acts like a turbine. The oil is sucked in and can only escape by the microscopic space left between the discs. The whole ROCS is then slowed, which prevents it from being disconnected from the base movement. The shock absorber is manifested visually by the rapid rotation of the runner disc integrated in the dial. The functions of the watch are the Hours, Minutes, Shock absorber (90 Seconds Runner) and Oil Temperature. The movement of the watch is the Patented ROCS 5 - Ressence Orbital Convex System - driven by the minute axle of a specially customised 2824/2 calibre ( automatic movement ). It runs at 28,800 vibrations per hour, has 41 jewels and a power reserve of 36 hours. The case of the watch has 46mm (diameter) x 15.5 mm (thickness). It has a uni-directional bezel and 10 ATM water-resistance. 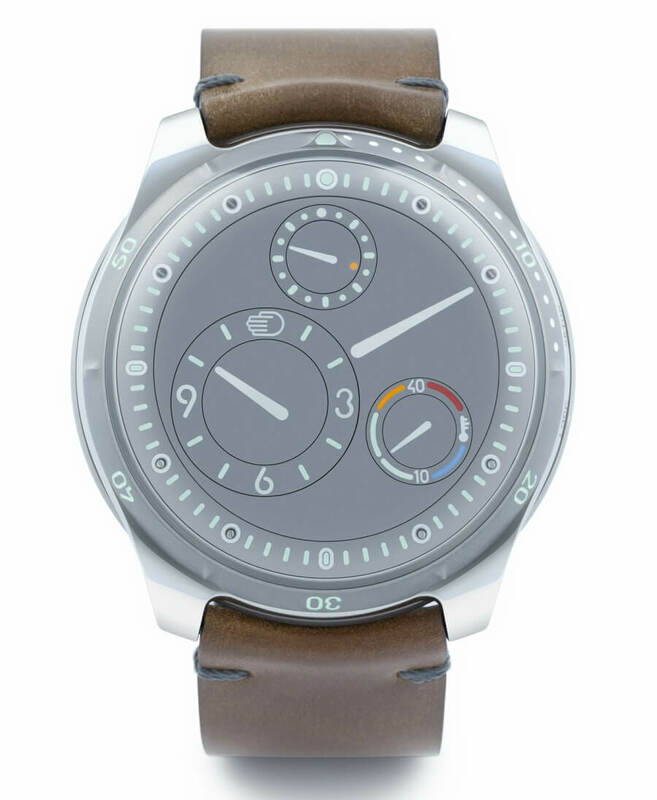 The price of RESSENCE TYPE 5G is 31.500 EUR (incl 20% VAT).